Nationally, over 90% of 17 year-olds in full-time education attend schools or colleges in the state sector (Source: Department for Innovation, Universties & Skills). 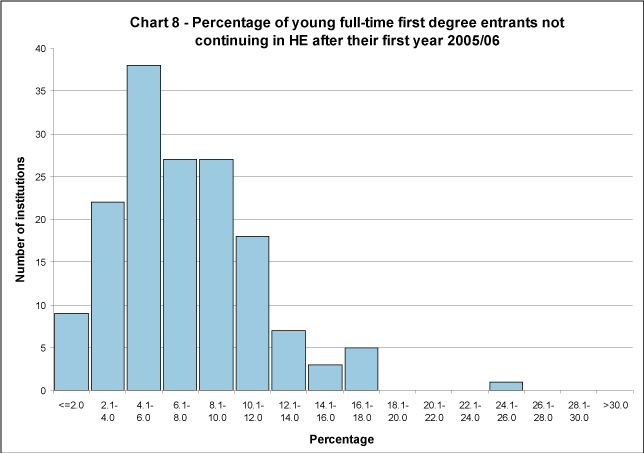 87.8% of young entrants to full-time first degree courses in 2006/07 had attended such schools, Chart 1 shows the pattern. Figures based on the Labour Force Survey and quoted in Regional Trends 39 (Source: Office for National Statistics) show that 47% of the population of working age with known classification (excluding NS-SEC class 8, long-term unemployed or never worked) are classified in groups 4 to 7, where classification is based on current or most recent occupation. Nationally, 29.8% of young entrants to full-time first degree courses come from this section of the population. The percentage of entrants from low participation neighbourhoods is provided separately for young and mature undergraduate entrants, both full-time and part-time. This year the method for defining low participation neighbourhoods has changed and indicators are based on the new POLAR2 method. This new method is not comparable with the low participation data produced previously and hence no comparison has been made between the two methods in this summary. More information on the POLAR2 low participation can be found in the widening participation definitions . 9.0% of young entrants to full-time first degree courses and 10.6% of mature entrants to full-time first degree courses (who also had no previous higher education qualification) came from low participation neighbourhoods. Tables C and D show the percentages for young and mature students for all the countries in the United Kingdom. As the method has changed comparisons between this years data and earlier years are not appropriate however, percentages have been calculated for Table C using the new POLAR2 method on 2005/06 data to provide a comparison for this years indictors. There is a difference between young and mature part-time entrants as regards this indicator. 12.2% of young entrants and 6.4% of mature entrants to part-time undergraduate courses come from low participation neighbourhoods. 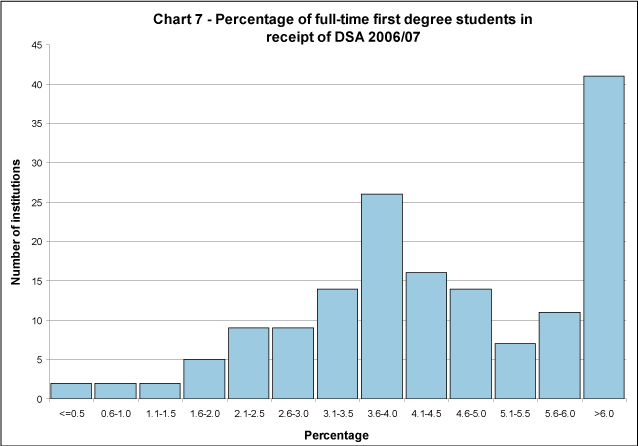 The proportion of students in receipt of DSA is relatively small. The percentage of such students on full-time undergraduate courses in 2006/07 was 4.3% (4.0% in 2005/06), with institutional values ranging from 0.0% to 19.9%. For part-time undergraduate students, excluding those at the Open University (OU), 2.3% (1.9% in 2005/06) were in receipt of DSA. The OU, with over a third of all eligible part-time students, had 2.7% of its students in receipt of DSA. In general, a higher proportion of mature entrants than young entrants do not continue in higher education after their first year. 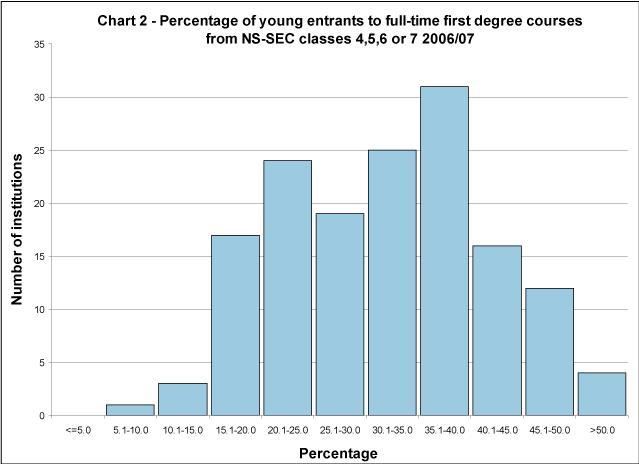 For full-time first degree entrants in 2005/06, the UK non-continuation rate is 14.3% (14.4% in 2004/05) for mature entrants compared with 7.1% (7.2% in 2004/05) for young entrants. The non-continuation rate for young entrants is 10% or less at 77% of institutions. For mature entrants it is between 2% and 21% at the majority of institutions. However, it is above 19% at around 7% of institutions. Tables G and H shows the non-continuation rates for the countries of the UK for the last 5 years, for young and mature full-time first degree entrants respectively. 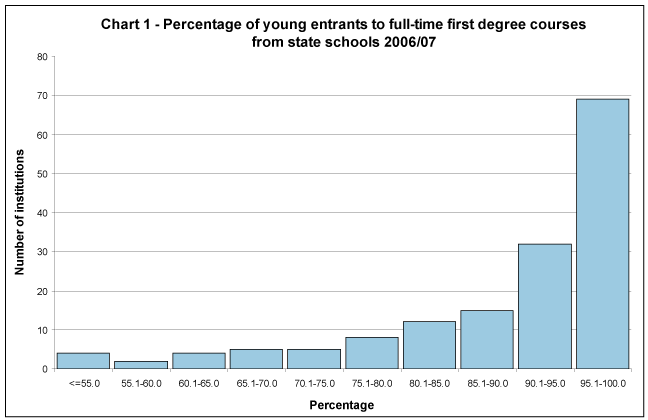 Charts 8 and 9 illustrate the spread of values between institutions in 2005/06, again for young and mature full-time first degree entrants respectively. In general, a similar proportion of mature and young full-time other undergraduate entrants do not continue in higher education after their first year. For entrants in 2005/06, the UK non-continuation rate is 17.3% (15.6% in 2004/05) for mature entrants compared with 18.2% (17.9% in 2004/05) for young entrants. Further information is provided in Table T4a about full-time first degree entrants who started at university or college in 2004/05, but were not in higher education in 2005/06. 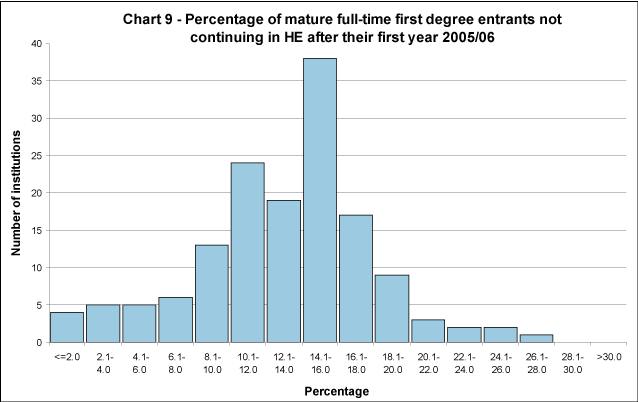 Nationally, 12.8% (12.3% in 2003/04) of young full-time first degree students and 11.7% (11.3% in 2003/04) of mature full-time first degree students in this category returned to their original institution in 2006/07, with a further 12.2% (12.3% in 2003/04) of young full-time first degree students and 5.4% (5.3% in 2003/04) of mature full-time first degree students transferring to another institution. 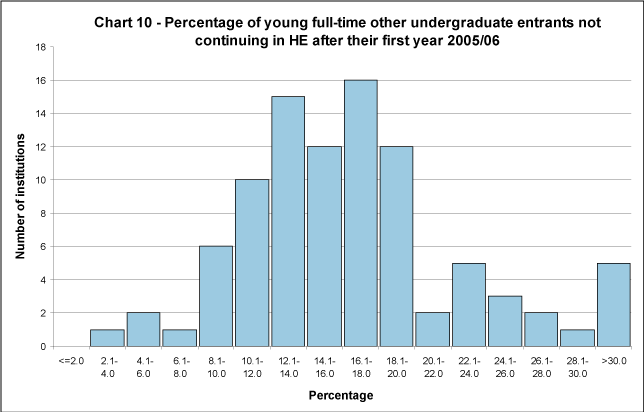 Similar figures are provided in Table T4b for full-time other undergraduate entrants who started at university or college in 2004/05, but were not in higher education in 2005/06. 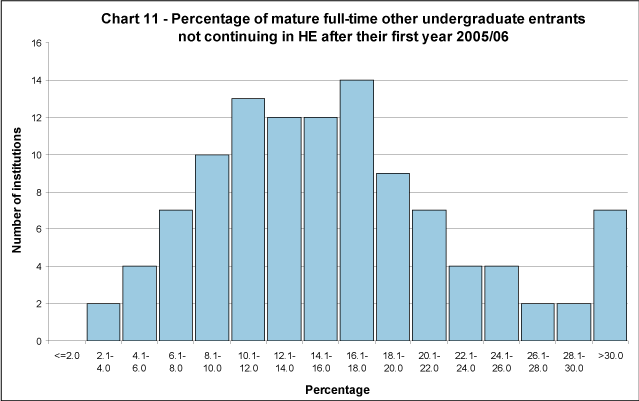 Nationally, 6.4% (7.6% in 2003/04) of young full-time other undergraduate students and 10.4% (8.7% in 2003/04) of mature full-time other undergraduate students in this category returned to their original institution in 2006/07, with a further 5.5% (5.4% in 2003/04) of young full-time other undergraduate students and 3.8% (4.9% in 2003/04) of mature full-time other undergraduate students transferring to another institution. The projected outcomes in Table T5 summarise the pattern of movements of students at institutions between 2005/06 and 2006/07. They give the outcomes that would be expected from starters at the institution in 2005/06 if these progression patterns were to remain unchanged over the next few years. The sector averages for the UK and its constituent countries are obtained by taking a (weighted) average of all the relevant institutional values. They show that 77.4% of full-time first degree students starting at an institution in 2005/06 are expected to qualify from that institution with a degree (77.6% in 2004/05) and 14.1% are expected to get no qualification (14.2% in 2004/05). A further 5.6% are expected to transfer to another institution (5.8% in 2004/05). The projected percentage of students who leave before gaining any award, and who neither return to study nor transfer to another institution, is less than 25% for the majority of institutions. Tables J and K give a summary across the countries of the United Kingdom. Table T6 looks at module completion rates for part-time students. The provision of this information is dependent on how student data are returned to HESA. Only institutions in Wales are required to return a module record to HESA, therefore this table only includes data on these institutions. The table shows what percentage of modules, undertaken by part-time students, are successfully completed and some statistics to put this percentage into context. For 2006/07, 67.0% (47.2% in 2005/06) of the relevant modules had results provided, and in 89.0% (89.6% in 2005/06) of cases the module was passed. On average each part-time student undertook 2.3 modules (2.3 in 2005/06), and each module was worth an average 13.9% (13.6% in 2005/06) full-time equivalent. The employment indicators are based on the responses to the Destination of Leavers from Higher Education (DLHE) survey, which replaced the First Destinations survey three years ago. 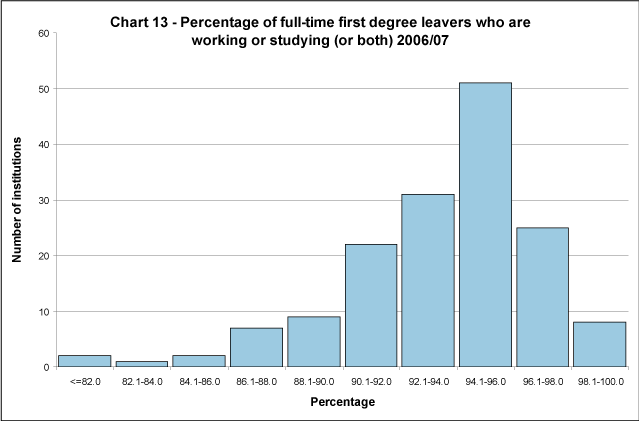 In 2006/07, the response rate to the survey for those graduating from full-time courses with a first degree was 80.1% (80.1% in 2005/06). Table M shows comparative results by academic year. The table below shows the employment outcomes of full-time first degree graduates by academic year, based on all respondents to the survey. The proportion of graduates who were in employment (excluding those in employment and further study) six months after leaving was 63.0% (62.9% in 2005/06), a further 8.4% (8.2% in 2005/06) were in employment and further study and 14.8% (14.8% in 2005/06) were in further study only.